Juno spacecraft is being prepped for Jupiter at Lockheed Martin Space Systems. 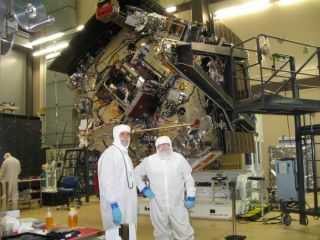 Bunny-suited Jack Farmerie, Lockheed Martin's lead spacecraft technician on the Juno project (left) and SPACE.com reporter Leonard David. LITTLETON, Colo. — I've never been so close to something that is going so far away. The Jupiter-bound Juno spacecraft is entering a series of vital tests before its planned liftoff aboard an Atlas V-551 rocket from Cape Canaveral, Fla., this August — and I got to see it firsthand. A unique outer-planet spacecraft, the solar-powered probe is slated to reach the giant planet in July 2016. Juno will map Jupiter's intense magnetic field, investigate the existence of a solid planetary core, measure the amount of water and ammonia in the deep atmosphere, and observe the planet's auroras. The Juno mission is the second spacecraft designed under NASA's New Frontiers Program. Here at Lockheed Martin Space Systems, the builder of Juno, the intricate spacecraft is getting a good and appropriate dose of tender loving care – something it will need when it encounters the intense radiation at Jupiter. This reporter climbed into a "bunny suit" (why it's called that, I haven't a clue, as it takes forever to hop into one) — the required clothing to get up close and personal with the probe. Assisted by Lockheed Martin spokesman and formal wear specialist Gary Napier, I donned a beard mask, slipped on shoes that resembled moon boots and got fully gowned, degaussed and spark-inhibited. Airlocking my way into a super-clean room, I felt well-suited. Still, I couldn't shake the feeling that I became an appalling commercial for the Men's Wearhouse: "You'll like the way you look." Waddling forward, I was greeted and comforted by similarly smocked Jack Farmerie, Lockheed Martin's lead spacecraft technician on the Juno mission to Jupiter. He's clearly proud of his job, one element of which is figuring out where to route boa constrictor-like cabling and wiring harnesses that snake throughout Juno. "Do you dream of cabling?" I asked Farmerie. "I kinda do. I've had some bad dreams on occasion," the technician responded, and said that he sometimes spends 10 to 12 hours a day just putting spacecraft connectors on — each one enclosing some 150 individual wires. Farmerie pointed to wiring harnesses all over Juno that are treated specially with copper overwrap. "That provides enough shielding from Jupiter's radiation … so the wiring will survive that environment. But that adds a lot of weight." Special attention is also given to assuring everything on Juno has the same ground potential — that is, avoiding electrical charging that could arc from one spot to another on the probe. "That would be detrimental to the science," Farmerie said. Juno is outfitted with a trio of huge solar arrays. The spacecraft benefits from advances in solar cell design with modern cells that are 50 percent more efficient and radiation tolerant than the silicon cells available for space missions 20 years ago. Juno will fly a highly elliptical polar orbit around the giant planet. That avoids most of Jupiter's high-radiation regions. It does so by approaching over the north, dropping to an altitude below the planet's radiation belts and then exiting over the south. Nevertheless, Juno features the first radiation-thwarting electronics vault — a uniquely crafted titanium box that protects key components from exposure to the heavy radiation environment at Jupiter. Technician inspects Juno's vault – a titanium box that will enclose key spacecraft components, shielding them from Jupiter's intense radiation fields. "The goal was, anything that we could fit inside the vault … we did," Farmerie told SPACE.com. "It was definitely the toughest wiring job I've had so far." Other "out of the box" items that dot Juno's structure have their own built-in shielding. Germanium-coated blankets are used to help counter whatever Jupiter throws at the spacecraft, he said, as are conductive Kapton film wraps. All in all, my intuition is that Juno carries nothing from Home Depot or any other general hardware store. "We have this thing called traceability," Farmerie said. "Every screw, every washer, every tiny little thing on this spacecraft can be traced back to the day we bought it and where it came from." Juno is being prepared for a set of tests to showcase its readiness to travel onward to Jupiter — and the August liftoff date is creeping up. "It's a line in the sand," Farmerie advised. "We do what we have to do to get to the launch pad on time. Usually that equates to overtime. It's a way of life for us." Tour of Juno over, back out of the airlock, I quickly shed my space-age coveralls to talk with Tim Gasparrini, Lockheed Martin program manager for Juno. "Jupiter is a harsh place to go … terrible radiation and you've got the charged- particle environment you have to worry about," Gasparrini told SPACE.com. "It's much more severe than designing a Mars mission." Contrasting Juno to other spacecraft Gasparrini has worked on: "It's bigger, and with bigger come harder," he said. Flying monstrous solar panels to Jupiter is a challenge, too. The giant planet receives 25 times less sunlight than Earth. "We've got some 50 square meters of solar array hanging out there," Gasparrini pointed out. Juno is going where no solar panels have gone before. Gasparrini said that solar array fabrication, early on, was troublesome: "Consternation a year and a half ago … got through all of that." A look at the Juno science instruments NASA will use to explore the largest planet in our solar system. Juno totes 25 sensors and nine experiments. "That's a lot of stuff. Lots of fields of view for all those instruments and lots of things that you have to keep happy," Gasparrini added. While in orbit at Jupiter, the spinning spacecraft will sweep the fields of view of its instruments through space once for each rotation. At three rotations per minute, the instruments' fields of view cut across Jupiter about 400 times in the two hours it takes to fly from pole to pole. Juno will orbit Jupiter 32 times, skimming to within 3,000 miles (4,800 kilometers) above the planet's complex cloud tops, for roughly one year. After that, it is to be de-orbited to avoid smacking into and contaminating one of the Jovian moons. As Juno's takeoff time to Jupiter draws closer, Gasparrini underscored the pressure to get the probe ready for departure. The drumbeat of several critical evaluations of the completed spacecraft is palpable. "You have this constant tension between mission success and a 21-day launch window," Gasparrini said. "You're doing everything you can to make sure that the spacecraft operates 100 percent flawlessly when it gets on orbit. But you have this realization and reality that you've got 21 days to get it off the planet, and that we're not doing anything foolish or shortsighted that we regret later on." Every spacecraft is different, Gasparrini concluded, each coughing up degrees of difficulty. "You go in thinking 'this is going to be the easy one'… and it's never like that," he said. "They all have their own challenges. That's why we do this … because it is challenging and it's exciting."